For someone who loves to go to Disney World as much as I do, you would think I would have found the best shoes for standing all day and walking the parks by now. I mean, sure I’ve had comfy shoes over the years. But this year is different. I turned 40 this summer and was assigned my mysterious illness just weeks before that milestone birthday. Since around May, I’ve been dealing with some pretty ferocious plantar fasciitis in my right heel and it has rendered nearly all my shoes useless. Something as simple as getting out of bed became extremely painful and you can forget walking all day. I normally have a quick pace, but on our summer vacation, I could barely keep up. My friend and fellow Disney Parks Moms Panelist, Kate, also happens to be a nurse and she recommended Oofos recovery shoes. I decided to buy a pair of sandals and try them out and y’all, I am changed. This post is a collaboration with Oofos. I contacted them after experiencing their awesome shoes and not only did they send me some shoes, they offered to give some to you as well! Read on to learn more and enter for a chance to win. My blog posts contain affiliate links, which means I may earn a commission on purchases made. OK so the truth is the best shoes for standing all day are the ones you can stand to be in all day. I know that sounds a little vague but different feet need different things. That said, I have been wearing Oofos sandals or the new OOmg recovery shoe all day every day almost exclusively since July and my feet have never been happier. For me, Oofos are the best shoes for standing all day by a landslide. Since I purchased my first pair of Oofos, I reached out to the company to see if they wanted to collaborate, and they agreed! They sent me another pair of sandals and the new OOmg shoe to try now that the weather is getting cooler. My husband also bought a pair and all I can say is I am “feeling the OO!” as their slogan says. Oofos are sold as recovery shoes for runners and other athletes but if that doesn’t describe you, don’t miss out. Their proprietary foam absorbs shock and feels fantastic on sore arches. They are latex-free and vegan as well. You can read all about the materials here. You don’t have to participate in a bunch of marathon weekends to have comfortable shoes. If you are like me lately and just getting out of bed hurts, Oofos really are the best shoes for standing all day or walking where you need to be. Another perk? They don’t smell! I wore my sandals all summer and rarely wear socks with the shoe and they do not retain odor, which is amazing. Are Oofos the best shoes for overweight people? In my opinion, yes Oofos have been the most comfortable shoe for me when I’m overweight. I’m working on taking that stress off my body, but thankful to have some good shoes that make life a little easier for me in the meantime. My weight has fluctuated my entire life and having shoes that fit properly, absorb shock and are supportive is essential for those fluffier seasons. I’ve found that my Oofos in both styles do this really well. Are Oofos worth the price? Oofos come in a variety of styles and a variety of prices starting at about $50 for the sandals. The first pair I bought were worth their weight in gold to me for the relief I experienced every single time I put them on. And while they did graciously send me a couple more styles, I will definitely be purchasing more when I need them. I can’t imagine not having at least one pair at all times. 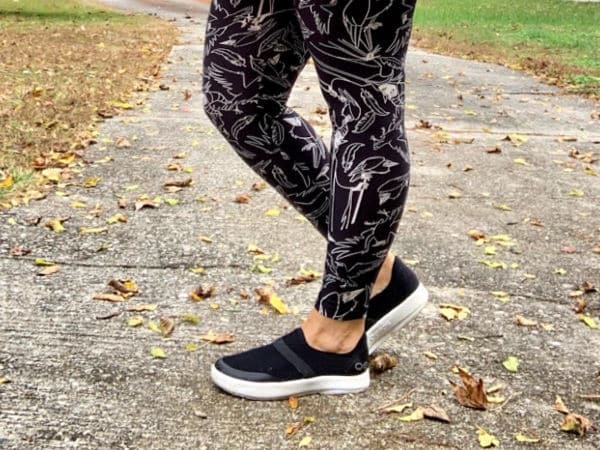 For fall, I am loving my Oofos OOmg low shoes and they are perfect for the colder weather. They also have clogs and just came out with a boot that I am super curious about! They are just that good. How long do Oofos last? Oofos recommends replacing your shoes after about 4-6 months of wear and tear. Of course, this time frame will vary based on your use. I wore my first pair of sandals almost exclusively for a little under 4 months and was still very happy with them. However, when the brand sent me a new pair, the difference was definitely noticeable so I tend to agree with their recommendation. Win a pair of Oofos Sandals! Now that you’ve listened to me crown Oofos the best shoes for standing all day, the best shoes for men or women, the best shoes for high arches and the best shoes for overweight moms who just want to stand and wash the dishes without cringing, I figured we should give some away! One lucky reader will get too “feel the OO” with a new pair of Oofos sandals! I seriously can’t WAIT to give these to one of you. To enter: leave a comment on this post and let me know what you love about Oofos or ask me a question I haven’t already answered. 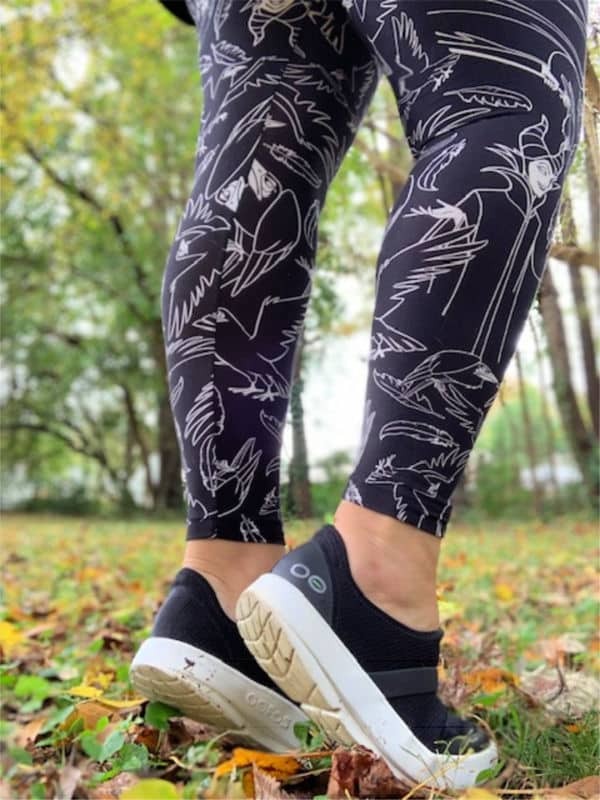 I am 100% hooked on these shoes and want everyone to have happy feet too! And from what I can tell, I’m not the only fan. If you know anyone else who would benefit from a new pair of shoes, please share this post so they can enter too! Also, be sure to keep up with the latest Oofos styles and updates on their fun Instagram account. You have until November 15th at 11:59pm ET to enter. US entries age 18 and older only please. Good luck! I have two pairs of OOFOS sandals and I love them! It’d be awesome to try the shoes. They look fairly stylish for being comfy shoes! These look interesting and extremely comfortable. I might have to try them. I’m always looking for stylish comfortable shoes that don’t look like old lady shoes. I love the idea of these. The sandals and shoes both look super comfy! My question. Are you a sandals in the parks person? I always wear shoes. These sound amazing! I suffered with plantar fasciitis for years and understand your pain. Do they fit true to size? Oooo!! Pick me! Pick me! I love comfy shoes! It’s like you know my google search history 😂 I’ve been looking for something to help my plantar fasciitis because nothing I’ve tried truly works! How did these not show up in my search?! I wish they made house shoes!! I’m liking those shoes you have on. I would love to try those! Question: are they strictly no socks kid of shoes? These look awesome! We are heading to Disney World in a few months and I am in need of a good pair. Thanks for sharing. My Skechers gowalks aren’t cutting it and these sound amazing!!!! I’m so excited to learn about new comfy shoes! I’m always on the lookout! Hey Amanda Jean! You’re the winner!! Woohoo! Be on the lookout for an email from me. Congrats! I have the flip flops (they are years old) and they save my back when I’m cleaning the house. I’d love another pair! 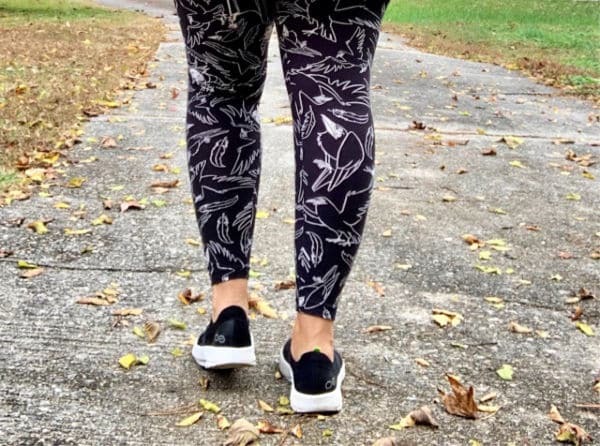 I have had 2 knee surgeries in the past few years and I have always been on the lookout for really good supportive shoes that can help making walking and standing easier for me. I have never heard of Oofo’s before reading this article and I am so eager to get a pair now! I would love to try these! I wonder, do they make non-skid work shoes? Super cute and comfy to boot!? Sign me up! OMG I have been struggling with Plantar Fasciitis since turning 40 too! What the heck? And I am a wannabe runner and athlete and now that I know recovery shoes are a thing, I absolutely need these in my life! I decided comfort trumps style now that I am officially in my 40s but these look cute too! And who am I kidding I still care how I look! I’ve been wishing for shoes like this. Look forward to buying some. I have a lot of pain in my feet & legs. I had to have a bunionectomy a few years ago and struggle to find shoes that are stylish and comfortable (especially around my surgical site). Do you find that the thongs stay put with little effort or do your feet slide out easily? My question: Do these come in wide? Or does the regular width fit a wide foot? I can wear most regular width shoes, but some are better than others. Another question: how many hours at a time have you worn them? Are they good for 8-10 hours of standing/walking? These really look amazing and I’m definitely up for trying them whether I win a pair or not! Do the sandals have a strap in back? I’m always in the lookout for comfy shoes— and that is especially important for days that we do lots of walking! I have Raynaud’s and sometimes, that makes even walking painful, so I would love to try these! Do these shoes provide comfort for the pain that comes with Raynaud’s? You had me at total comfort. I have yet to find a pair of shoes that can help support my feet after being on them all day long! What an awesome brand it sounds like, love to win a pair! 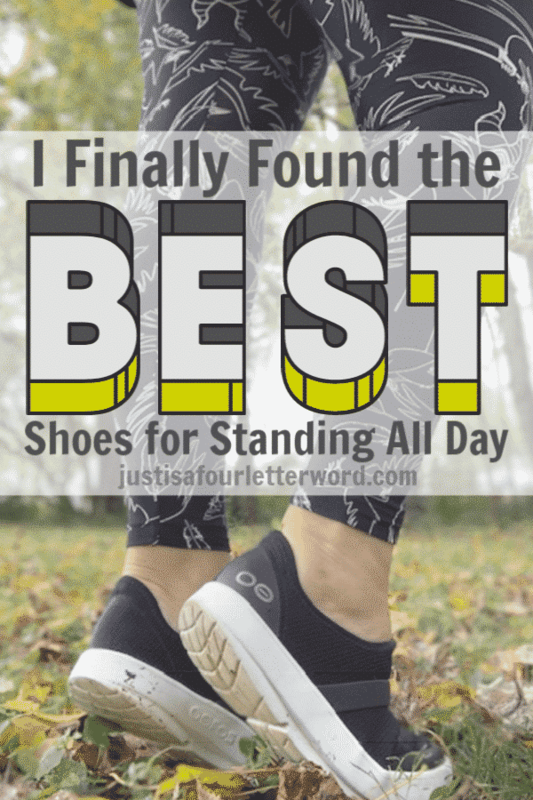 I love that these are comfy – I stand a lot and HATE when my feet get sore! Thank you for telling us about these great shoes! I have never tried them or heard of them, until I read your post. My sister is a school teacher of 15 years & has constant foot pain & has high arches. She’s had 2 knee surgeries & can only wear certain shoes. I can’t wait to tell her about Oofos! Please consider her for your giveaway, not only is she a great teacher but also an amazing mom to twins….her feet go through A LOT 😊. Do they have wide width? Thank you so much!